(Boston, MA) Every Brilliant Thing is a story about a woman’s appreciation for living as told through a long list of joys. Audience participation is nearly mandatory. Adrianne Krstansky is so welcoming that volunteering is fun. The Calderwood Pavilion is a safer space for an hour. Krstansky plays a nameless character who takes it upon herself to collect reasons for her depressed mother to live. The list is called “Every Brilliant Thing.” Mom isn’t receptive but our Narrator continues the list over her lifetime. Audience members fill in for secondary roles such as the Dad, the Vet, and a sock puppet therapist. We are the community that supports through Mom’s suicide attempts. Everyone is enfolded into the production. 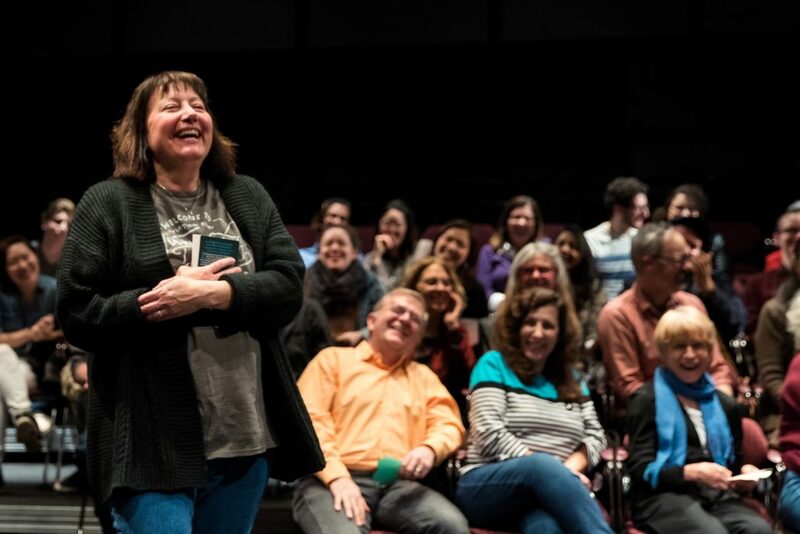 Krstansky is a storyteller full of such affable warmth that she could entice even the most curmudgeonly of patrons into audience participation. Her telling is so sincere that I’d forgotten that the playwright was a white man. MacMillan scripts the narrator as genderless. Yes, the majority of the plot occurs in the late 20th Century, the first performer to tackle the role was a man, but the Narrator could be played by anyone. Gender, race, and sexual orientation are arbitrary. In theory, an actor could adapt the script to their identity. Every Brilliant Thing is a community discussion on mental health, specifically depression. We are connected by our decision to attend that day’s matinee. Audience participation isn’t actually mandatory but it does make the theatre experience more enjoyable. Krstansky is an affable, generous hostess. She is worth every moment of potential social anxiety. Our Narrator references the Samaritans’ guidelines on reporting suicide. These guidelines are an excellent tool for exercising compassion/empathy after a death. Suicide is factually contagious. The death rate spikes after a community reports one. Even uncareful verbal discussion can influence one’s decision to choose death by suicide. Further guidelines for digital media are HERE. Samaritans operates in the UK. US residents at risk or who know someone at risk should please call the National Suicide Prevention Lifeline at 1-800-273-8255. The Deaf/hard of hearing should call 1-800-799-4889. There is also a chat option. For the Veteran Crisis Line, please text to 838255. This entry was posted in Comedy and tagged 2018, Adrianne Krstansky, Boston, boston center for the arts, dead dove do not eat, Duncan McMillan, Every Brilliant Thing, Jonny Donahoe, MA, Maggie Hall Photography, March, Marianna Bassham, National Suicide Prevention Lifeline, Samaritans, Speakeasy Stage Company by Kitty Drexel. Bookmark the permalink.